This morning Beth and I went for a 10 mile run. It was cool, correction, it was cold! Broke out the tights and got ourselves ready to go. I broke out the out ipod second generation for the trip and listenend to Florence + the machine during the run. It gave me just the boost needed to keep up the 10 1/2 minute pace for the course of the run. There were a couple of different times after mile 7 that I needed to remind myself that “I am strong, my breathing is good, my form is good, and I can do this.” This became my mantra when I felt tired or found myself thinking about how much of the course was still left. Today is my penultimate day for my 90 day experience. As I look back over the last 89 days, I am struck by how much running plays a part in what I do and the relationships that I have. I never considered myself to be a runner, but I after my upcoming half marathon, I may have to alter that perception. Somebody asked me the other day if I would be done running after the half marathon. My first reaction is, uh–no, but then I thought about it, what will I do when the half is over? My friend Jay will probably tell me that he sees a marathon in my future! 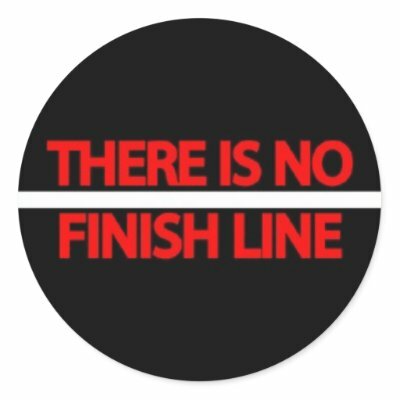 What I realized is that there is no finish line with this experience. Once you start being more active, you don’t want to stop. Why would I want to be become that weak man-child again? Why would I want to become sedentary and unmotivated again? So I’ll continue to set a new line and start a new experience. Last evening I was checking out P90x. I don’t think I can make the time committment to that, but I know that I could use it to continue my strength building and becoming leaner. In 20 days, Gary runs his first 5K and the next day Beth and I run the half marathon. From there I’m wide open for the next adventure!